You know how it is when kids draw; first a line of grass at the bottom of the paper, then a line of blue sky at the top, with everything floating around in the white space in between. It's normal, and just about every child does it, but oh, all that wasted middle ground! This drawing lesson is all about the horizon line ... that place where the sky meets the land. It's simple, it's essentially foolproof, and the directed drawing element gives kids enough choices for types of lines and shapes that each child's composition maintains a personal feel. 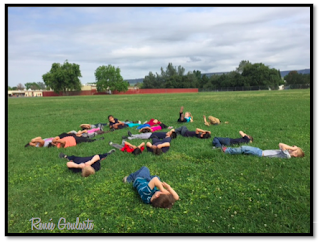 It's a great art lesson for a spring or summer day... any day when there are some puffy clouds in the sky. I taught it on a sunny, spring day in a Kindergarten class. I knew I would be back another day that week, so I took photos, printed them later at home on card stock, and brought them back to finish off the art work another day. First, I read a book about clouds and we spent some time looking at the illustrations. We talked about the shapes of the clouds; using descriptive words like puffy, stretchy, misty, etc. Then we went outside and actually looked at the clouds. On the grass. 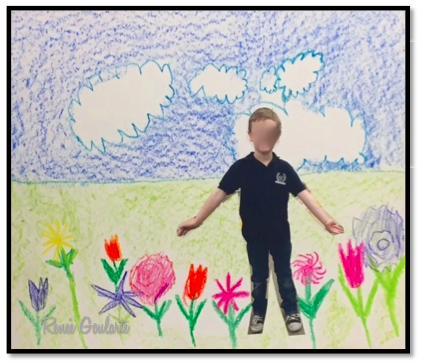 This lesson uses a directed drawing strategy.... I call it "my turn / your turn".... and starts with the horizon line, which can be straight, curved, or a little wiggly to suggest some rolling hills. Clouds on top, flowers on the bottom, and the drawing part is pretty much done except for the shading. In my lesson I gave lots of options for clouds, using those descriptive words again, and demonstrated different shapes before having students draw. Flower shapes varied from very simple to more detailed and again, I demonstrated several ideas first, then had students draw theirs. Then I showed how to shade all the foreground and all the sky, leaving no white space. While they worked on theirs, I got the bright idea to take the photos. Thank you, iPhone in my pocket! It's the addition of the photo that makes the composition come alive and really emphasizes the concept of foreground and background. I had to do some experimenting at home to get the size correct, because I wanted the people to be too tall to fit only in the grass or fit on top of the grass. Cutting out their photos gave these Kindergartners some serious, careful cutting practice. I encouraged them to try their picture in different places before gluing it down. We did this lesson just for fun, but it would fit beautifully as part of a unit on seasons, or weather, or clouds.... there are so many possibilities! 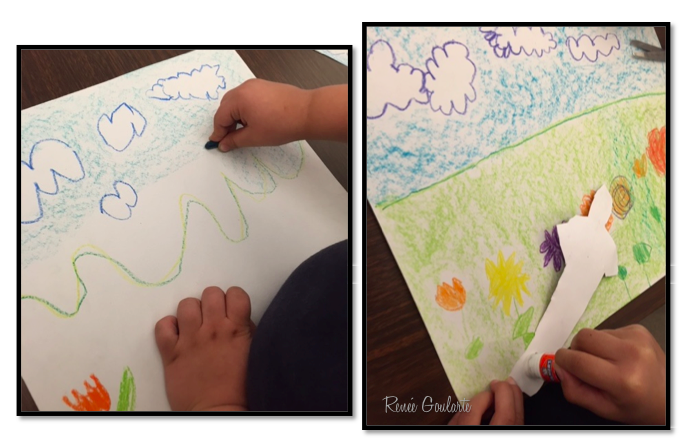 It's a simple lesson that introduces art concepts in a natural way, guides students toward learning to use the whole paper by drawing full backgrounds. This lesson is available in my TeachersPayTeachers store. 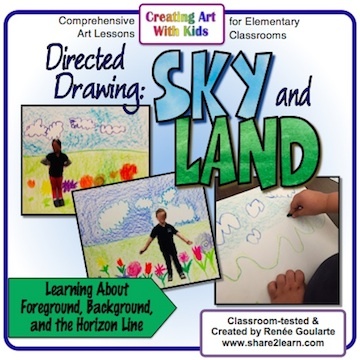 It includes step-by-step directions, sample drawings of horizon lines, clouds, and flowers, and two 'art reflection' worksheets to add a little personal art analysis and a writing component. Look for it here..... and enjoy! Simple paper sculptures are a perfect introduction to 3D art for Kindergarters and first grade students. I have done these in a variety of colors, but during March when students are learning about leprechauns, I have them use only green paper. 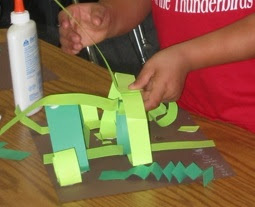 With these green "Leprechaun Playgrounds" I encourage students to create as many three-dimensional elements as possible. Of course I demonstrate twisting and folding techniques, but it's amazing what they can come up with on their own. Prep is easy; simply cut tons of paper strips from the 9" end of 9x12 construction paper, roughly an inch wide. No measuring is necessary so don't worry about the width. In fact, variation in widths of the paper is even better. In fact, if students are fairly practiced with scissors, it's even better to have them cut their own strips. I like to also provide a few 4x4 inch squares on each table for kids to make cylinders, or to cut out shapes to use along with spirals, accordion fold, circles, or whatever else they might come up with. Some students may decide to make paper chain loops that hang loose. Once I even had two little girls attach several strips to end to end, creating long, long tails that hung down to the floor. 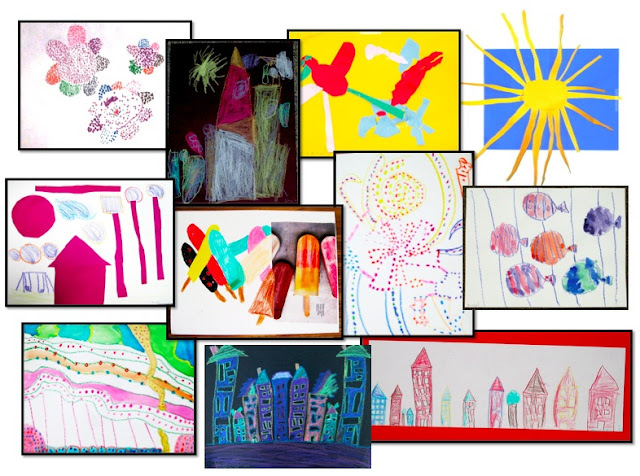 This simple art lesson that delivers a lot of learning for little ones: lots of scissor practice, lots of use of those fine motor skills, lots of experimenting with paper folding, and lots of just plain fun... all in the context of an authentic art lesson that introduces children to sculpture as an art form! 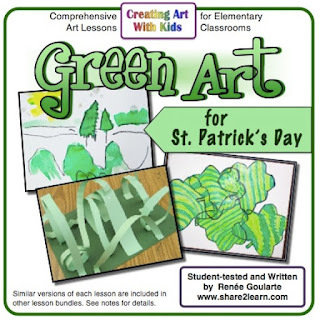 Check out this lesson .... and two more 'green art' lessons for St. Patrick's Day, here in my TeachersPayTeachers store! Enjoy! Coloring is big right now. Real big. Everywhere you look, you see coloring books. Adults are coloring big time. So it's not just for kids anymore. Coloring is great for fine motor practice. But let's be honest. Coloring other peoples' drawings is not the same as making art. As an art teacher who works hard to make sure that my art lessons are a combination of instruction in specific techniques or subject matter and a focus on kids' own creativity, the proliferation of coloring books and the focus and attention on coloring is something I look at with a dubious eye, because I know that a drawing of a family created by a child is so much more interesting than a coloring page of a family. Coloring is fine, but it should not be used replace real art instruction, especially in today's standards-based, test-heavy classrooms where students creative opportunities are already cut to the bone. Don't get me wrong. I am not anti-coloring. But I am pro-art education, and I know the value of allowing students to create their own masterpieces. That can never be done with a coloring page, because all the student is doing is filling in somebody else's idea. A student who draws herself inside a tent on a rainy day with the sun shining and flowers growing is learning a whole lot more than a child coloring in a traditional picture drawn by an adult. In classrooms, coloring pages are often used as filler, handy for when a student finishes an assignment, or easy for a rainy day recess. And there's nothing wrong with this, as long as we recognize what it is: a relaxing activity that might help develop concentration, eye-hand coordination, and small motor skills. But please, please, let's not call it art. Or better yet.... give kids some blank paper and a marker and let them create their own coloring pages! Or give them scissors, paper and glue and see what they come up with! .... because coloring is not the same as making art. 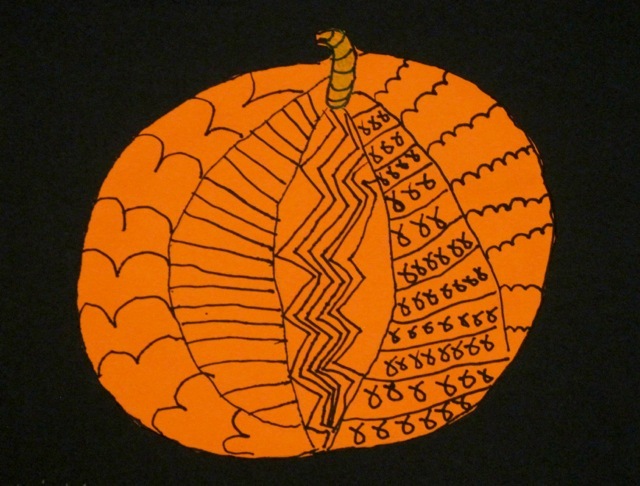 Check out my TeachersPayTeachers store for teacher-friendly, authentic art lessons that rely on student creativity and which easily integrate across the curriculum. Enjoy! Need some ideas? Start with this free resource: Making Time for Art. Too many standards to cover? Too much testing to deal with? 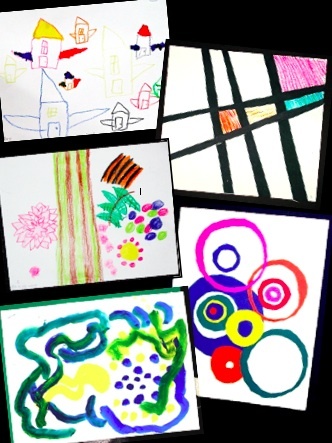 These nine easy ideas can help foster creative thinking, problem-solving, and art appreciation in the classroom, with no extra time required! 1. Have students occasionally use colored pencils for writing. Why not? Maybe they can color code their paragraphs and essays - topic sentences in one color, supporting sentences and details in another color. Or maybe writing in color would be just plain fun! And more interesting! 2. Use examples of well-known art works to teach, reinforce, or review selected Language Arts strategies or Math vocabulary. Compare two art works. Make inferences about the artists' thinking or the actions or thoughts of people portrayed in art works. Use descriptive vocabulary to describe art works.This freebie can give you some ideas and get you started. 4. Ask students to draw their responses to literature or informational text. Drawing responses activates visual thinking and can include details in ways that just writing cannot do. In fact, if students draw *first* and then write, you might see more detailed, more descriptive writing. 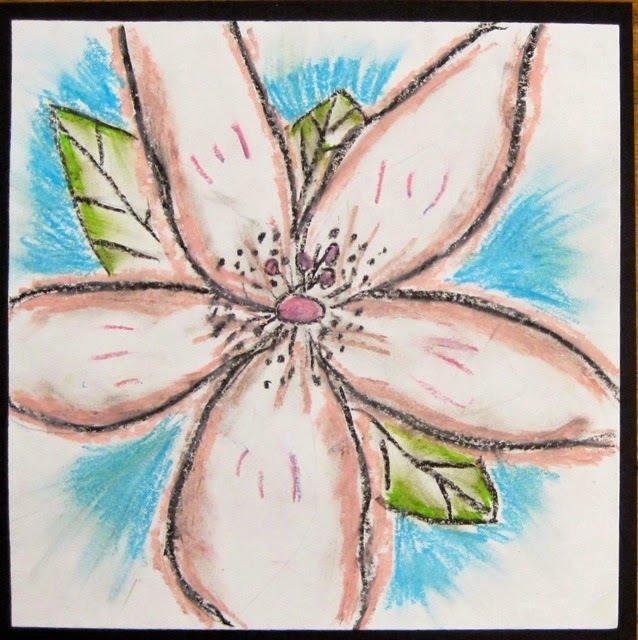 Try this free Draw and Write Literature Response sample! 6. Have students keep a sketch book. Make simple sketch books with copy paper folded into a construction paper cover. Have students sketch when their work is finished, or give a weekly sketch prompt as morning "bell work" instead of a worksheet. Have them sketch every Monday morning, something that reflects their weekend. 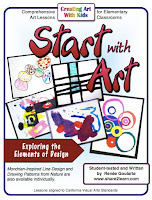 Use the sketch book not just as an "extra" but incorporated into the existing curriculum or schedule. 7. Put homework (or other worksheets) on colored paper. How easy is this? Just for fun, once in a while, bring color into the mix. I wonder if homework on colored paper would be more likely to be returned? 8. Assign drawing for homework. Draw a scene from a television show. Draw your family. Draw what you see from one of your windows. Or just draw. 9. Most importantly, have basic art materials available at all times. Invite students to use them as they desire, not only for art activities but to add a creative element to everyday written work. A small space is all you need, stocked with colored pencils, extra crayons, glue, construction paper scraps, scissors, and markers. These are common materials available in most classrooms. Rather than thinking of them as "art materials" what if students knew they were able to use them at any time? Bring creative thinking into students' lives without creating more work for yourself. 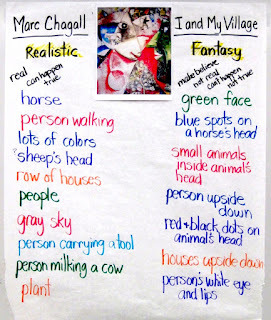 Giving students creative choices for their regular class work and homework might.... just might.... help develop visual literacy, a creative sense, and appreciation for art that's all around us on a daily basis. 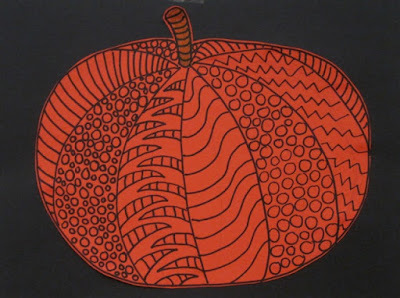 This easy art activity is perfect for anytime in October. 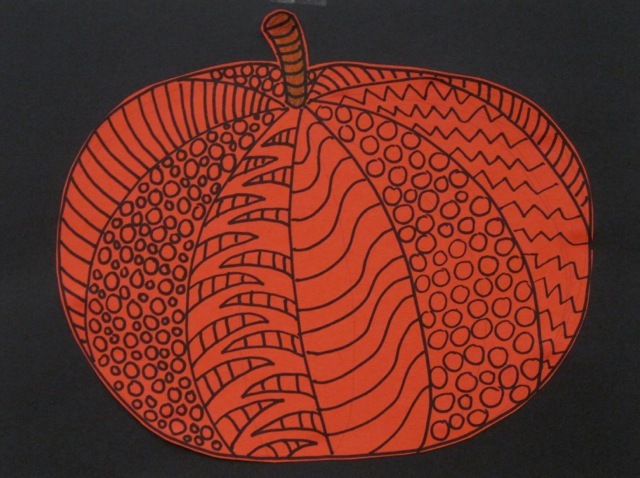 Students work with lines and patterns, and teachers get some great art for display! All you need is orange and black construction paper, some sharpies (or black crayons), scissors and glue, and about an hour at most. To draw the pumpkin shape, have students draw ... with pencil.... a "flattened" circle and add a stem a little way down in the center. 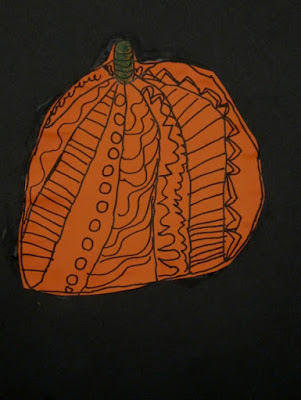 Then show them how to draw the vertical lines, just a little curved, with some going "backward" from the base of the stem. These gently curved lines are what gives the pumpkin drawing its three dimensional look! In fact, it's a very simple technique for giving a flat shape a three-dimensional look! Trace carefully over the pencil lines with a black sharpie, then fill each space with a different pattern, using lines and/or simple shapes. It doesn't hurt to talk about patterns before drawing... and even doing some simple examples. The key here is that every space needs to have a different pattern! When the patterns are finished, color the stem green if desired, cut out, mount on black paper, and it's done! 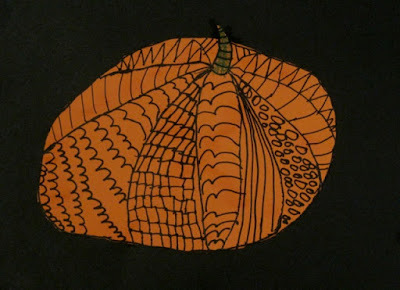 It's easy, it's fun, and, like all Zentangle work, it's totally relaxing. Perfect when you need to just take a break! For more comprehensive Halloween art lessons, visit my TeachersPayTeachers store! Just click on the TeachersPayTeachers logo up there on the sidebar! Another school year will be starting soon, and I look ahead to creating art with kids when substituting in my friends' classrooms. It's great fun to watch students be creative, to help them see that there is more than one right answer to an art-making challenge and to see them learn that creativity means letting go a bit and taking some risks. I also love just giving them some time to use their imaginations and express themselves. Sadly, I hear more and more teachers say they don't have time for art. 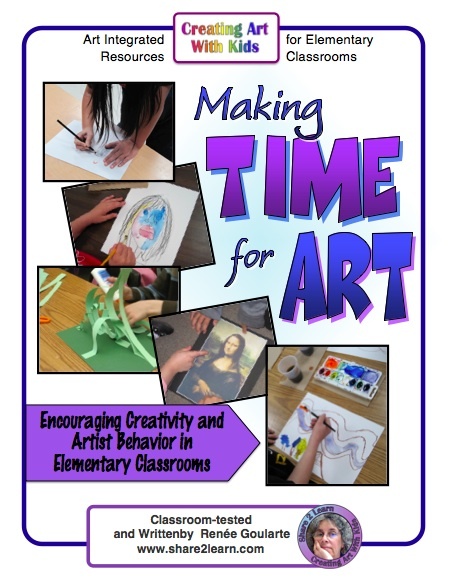 • ideas for teaching students to think and act like artists. Making art is important for all students, and it's especially important for those who learn best with hands-on experiences and those who learn visually. Art experience is instrumental when students need to illustrate a story or poem, create a graph or chart, or use pictures or other graphics to supplement or support their writings. 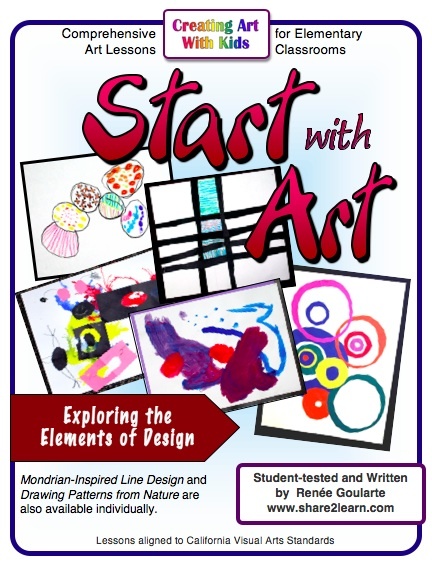 Start With Art includes five comprehensive, open-ended art lessons that introduce young students to the elements of design and allow them to work with a variety of simple, common materials. Each lesson takes about an hour, including an introduction and a "talking about art" session where students analyze the success of their own art work. I know that there IS time for art in every classroom, if a teacher uses time creatively and understands that visual literacy is just as important as other kinds of literacy. 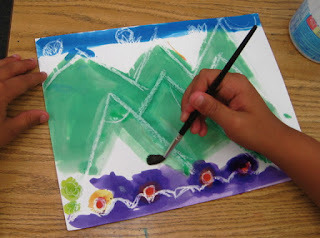 Creating art with kids ..... enjoy it! 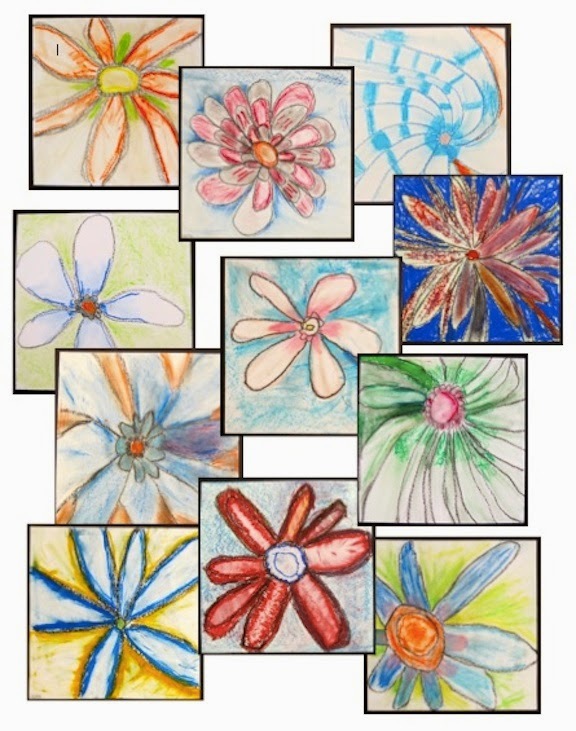 It's a common art lesson: close-up, enlarged flowers inspired by Georgia O'Keeffe's paintings. In this case, instead of paint, we used oil pastels. And because this particular second grade class had not used them before, I did do some modeling before turning them loose to work, showing them how to put down a bit of color and then spread it out with their fingertips to create the shading. They came up with the word smear during the demonstration. First we did look at several examples of O'Keeffe's flower paintings. I chose ones that showed the centers, and made sure I had at least a few that went "off the page" because that was what I was going to ask them to do. 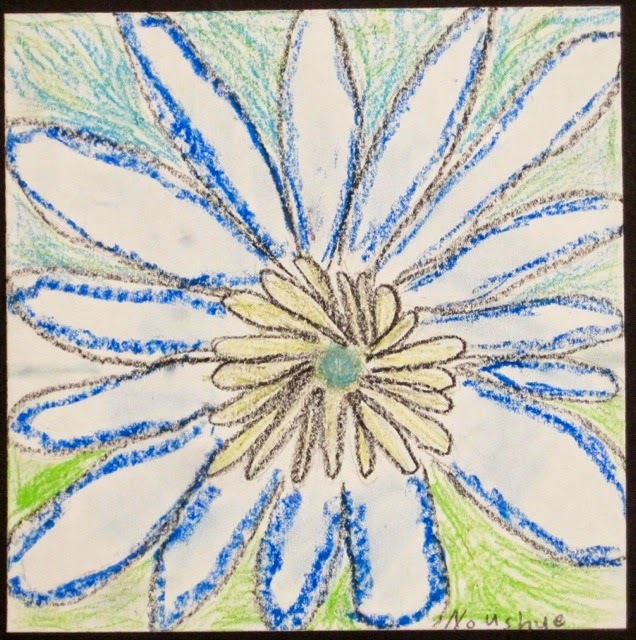 They noticed that her paintings used bright colors, that the centers of the flowers had extra petals or other interesting parts, and one student noticed that there was a lot of shading. Yes! So on the chart I was creating, I set that word aside and gave it some prominence. I also wrote the word close-up off to the side, and reiterated that they would draw a flower in close-up, then shade it. To demonstrate how to draw the flower itself, I showed them how to position a loosely drawn circle near the center of the paper, but not directly in the center, they to draw petals that went totally off the paper. I made a dramatic display of completing the petal shapes -- in the air, but not drawn -- going beyond the paper's edges. 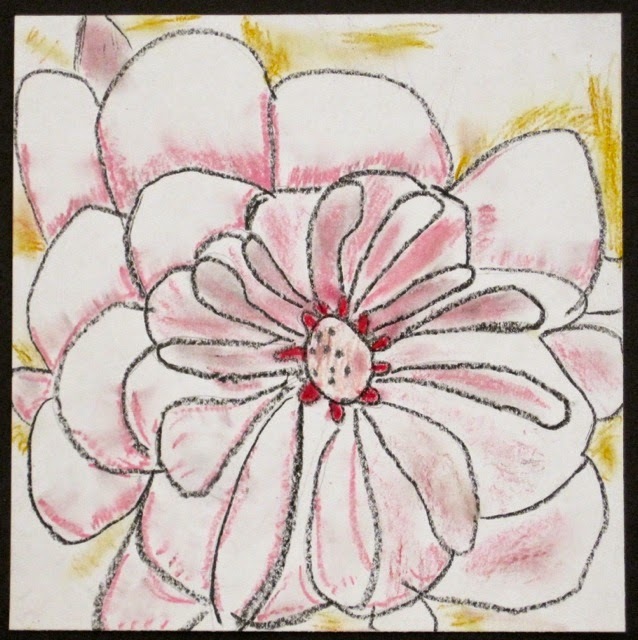 After demonstrating how to use the pastels, I posted several large, close-up photographs of flowers and had them take a look at color, shape, and some of the details in the centers of the flowers. I had intended to get into a discussion about radial symmetry, but decided to leave that for another time. So I sent them off to create their own. And we ended up with some beautiful results. But before we got to this end point, some interesting things happened. Like one student doing the shading with the side of her fist. Like another student pressing some of the oil pastels so hard that the color was thick on the paper, with tactile texture, and the black lines from the Sharpies were missing. Like a few of the students deciding to color their flowers with each petal a different color. I don't know if it's right or wrong, but I redirected these multi colorings in a direction that was more scientifically accurate, such as petals that were the same all the way around, whether they were one color or several colors. So I learned some things, too, and had some things to consider. Like, how much modeling is enough? How much is too much, and how much is too little? Like, how much explanation is necessary? Like, at what point should a teacher just let the students mess with the colors, and at what point does the teacher step in and suggest something that is liable to produce a result that is more likely to follow the initial directions? I want them to be creative, but I also want them to learn art technique that works, how materials are used to their best advantage, and to end up with a successful piece of art work that still shows their personality, and not mine. And most of all, I want them to think about what they are doing in the process, to take care with it, care about what they are doing, and like and be proud of it when they are finished.